No Pull Piercing Discs are now available to buy in the UK from JoBananas Body Jewellery. JoBananas are now UK stockists of No Pull Piercing Discs. These tiny 7mm discs are made from Medical Grade Silicone, providing a nice soft cushion to protect piercings from the back of barbells or labret studs. The discs were designed for oral piercings and wearers of labret studs, they will fit 1mm (18 gauge), 1.2mm (16 gauge), 1.6mm (14 gauge) and 2mm (12 gauge) body jewellery. The No Pull Piercing Discs are a fantastic idea and prevent the jewellery backs from irritating the piercing and also stop the jewellery becoming embedded in the piercing. NoPull Piercing Discs are made from flexible silicone and can be autoclaved which means that they can be used by piercing studios in new piercings which will aid with the healing process and reduce irritation. A piercing study is currently being carried out by Pain Magazine upon reports of the NoPull Discs having such a positive effect of scar reduction when worn, against hypertrophic scarring in healed piercings. We will keep you updated on the progress of the study. Clean discs with a mild unscented antibacterial soap & hot water and / or alcohol before wearing in ear piercings and rinse well. 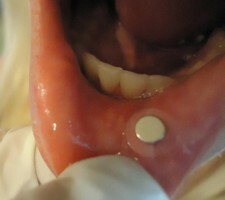 Your piercer can autoclave the no pull piercing discs for sterile application and for new piercings. Wear a bar or curved bar - not a ring! Apply No Pull disc to one or both sides of the jewellery - if the bump is both sides, wear a disc on both sides - they should lie directly but gently on the affected area, you may need to wear a slightly longer bar than usual to accommodate the disc(s) to ensure that the jewellery is not too tight. It is very important that your jewellery feels comfortable. Please do not remove the disc from your jewellery whilst it is healing as this may cause trauma to the wound, wear as long as needed to eliminate the bump - usually 2-4 weeks. Use a mild, unscented soap OR saline wash no more than twice a day and rinse well to ensure no residue remains. Dry with a tissue and do not keep touching the piercing. "come well packaged and on time just what i was looking for and a nice chose of sizes"
"The titanium PA barbell is great quality and the colour was what I was after. The service from Jo is great too, thanks." "I made a build your own bar for an Indistrial piercing and I bought an adorable bee honeycomb bar. I was an international order and had some issues..."
"Hi their , Received both my orders , Very pleased with the products , Thanks"